Yes! The Neti Pot has been used for thousands of years in India and other parts of the world, and has recently been studied by Western doctors who have concluded that the Neti Pot is safe and has no adverse side effects. I used the Neti Pot and it burns! It feels like I inhaled pool water! You may have set the water temperature too high, or you may have too much salt in the solution. If you have checked these points and you still have burning, use non-iodized salt. Iodized salt causes irritation in some people. Where does the Neti Pot come from? The Neti Pot was originated thousands of years ago in India by those who practice Yoga, in order to help cleanse the body. Today, many people in India and across the world who believe in alternative medicine use the Neti Pot to keep their nasal passages clear and healthy. Does it really help relieve a blocked nose? Yes! Studies have been conducted that show that the use of the Neti Pot is just as effective in helping relieve blocked noses due to allergies and sinus infections as prescription medications. Is there anyone that should not use the Neti Pot? People who have had nosebleeds or recent nasal surgery should not use the Neti Pot until they have consulted a doctor. Can I use something besides saline solution in the Neti Pot? Some advanced users of the Neti Pot use warm oil and herbs in the Neti Pot, but this is only for every experienced users of the Neti Pot. Lukewarm saline solution is just as effective, and is simple and safe to use. Is there any blockage that the Neti Pot can't help? Some hardened and severe blockages may need a few uses of the Neti Pot to clear. Also, individuals with a deviated septum or a nasal polyp may need other medical interventions, such as surgery, to completely clear the nose. However, Neti Pot can give these patients have some relief. What kind of Neti Pot is best? 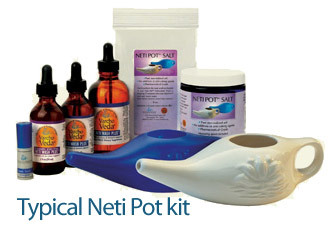 Neti Pots can be made of many different materials, such as plastic, ceramic, copper, or stainless steel. Most experts agree that the stainless steel types of Neti Pots are best, because they are the most sterile, can hold a large amount of solution, and are durable. Ceramic Neti Pots are often too small and fragile, while plastic Neti Pots tend to deteriorate more quickly due to the salt water solution used in the process. Copper Neti Pots work well, but are often expensive and can leave residue in the nose. There are also different designs and shapes of Neti Pot, but as long the nozzle of your Neti Pot fits comfortably in your nostril and creates a seal, so that water does not escape, and so long as it holds at least 16oz of water, it will work well.